The following article appeared in the February 1983 (Vol 5 No. 2) issue of Darkroom Magazine (pp. 36-40, 43). Color analyzers disappeared with color darkrooms, but at one time they were hot stuff (as the prices attest). A color analyzer buying guide from the same source appears here. Color analyzers are among the most controversial denizens of the darkroom. Some printers regard them as indispensable, while others seem to make lots of perfect color prints without their assistance. So it's natural to ask: What exactly does an analyzer do for you, anyway—and how does it do it? In this survey article, we'll try to answer these important questions and discuss the various features available in today's analyzers. Some advanced printers are able to eyeball a projected image on the enlarging easel and come up with an almost intuitive decision about exposure time. They'll stop down the lens until the image "looks right," then say, "That needs about 10 seconds." It's a combined "eye and memory" operation; the appearance of the easel image is compared mentally to memories of other recent work. The marvelous biocomputer we call our optic nerve and brain then suggests an appropriate exposure time. Color analyzers work in very much the same way, except that they can read color as well as exposure. They're just a sophisticated extension of the printer's eye and memory. Every analyzer has a highly sensitive electronic eye, plus a four-channel memory. This memory is capable of storing the color and exposure data which produced a successful print from a "standard" image. Thus programmed, the analyzer's eye and memory circuits will judge any untried image against the stored standard. En-larger filtration and lens aperture are manipulated until they "zero out" the analyzer, and presto! The color and brightness of the new image are now matched to the standard. In this way, the analyzer helps the printer decide how to expose the new image. When the entire procedure is done properly, analyzers are amazingly accurate. However, there are pitfalls. But before we look at what can go wrong, let's talk about that "eye-and-memory" system in more detail. The easel probe contains the actual "eye" of an analyzer. In "spot" programming and analysis, the probe's light sensor is manually placed in a pertinent area of the projected image (usually a flesh tone, middle gray patch, or a textured highlight or shadow area). Generally speaking, a small sensor is preferable, allowing even a tiny image area to be accurately probed. Some workers prefer a larger sensor, though, so many analyzers start with a fair-sized sensor, then provide one or two aperture attachments that can reduce the effective size as desired. Two types of sensors are used these days: silicon blue cells (SBCs for short) and photomultiplier tubes (PMs). SBC-type probes are connected to the main chassis box of the analyzer with a wire cord. PMs may be located in the probe, with a wire cord carrying electrical signals to the chassis; or they may be located in the chassis itself, in which case a fiberoptic cable transfers light from the probe to the PM. All three variations work fine in practice. The only significant difference is that probes with built-in PMs tend to be bulkier and more prone to damage if dropped. On the other hand, if the PM is in the chassis, care must be taken to avoid kinking the fiberoptic type of cable. One other probe consideration is the so-called "cosine correction" provision. If the probe is used directly under the lens, there's no problem. But out towards the edges and corners of the easel image, most sensors must be tilted until they are aimed directly at the lens. So there's typically a support cradle which allows the sensor to be tipped and locked at the correct point. This is usually determined by adjusting the tilt angle to obtain a minimum readout, but more and more manufacturers are providing some sort of sundial-like shadow post on the probe. This greatly simplifies cosine correction; when the shadow disappears, the sensor is aimed perfectly at the lens. There are a few exceptions to all of this: some probes, such as those used by Eseco, have sensors whose design makes cosine correction unnecessary. Some of the Beseler probes allow you to make limited cosine corrections by positioning the probe, although the probe itself does not tilt. Other probes, such as on the Rodenstock and Philips units, are designed to make "integrated" readings of the entire image, and are therefore used directly under the lens at all times. The Rodenstock, in fact, is not used on the easel at all, but instead is attached directly to the lens: it has no probe as such. The memory of an analyzer has four channels: cyan/red, magenta/green, and yellow/blue color channels, plus a neutral "exposure" channel for reading overall brightness. A "channel selector" knob is the usual way of switching from one to another, although some analyzers use pushbuttons, and others read all three colors simultaneously and therefore require no selector. Electronically, the memory is quite simple; it's based upon relative positioning of one or more potentiometer (variable resistor) knobs for each channel. It's "one or more" because some units have just a single adjustment for each channel, while others have coarse, fine, and even extra fine knobs. In practice, it makes little difference whether there are one, two, or three— they all work well. It's easy to keep one program stored in an analyzer; just set the knobs and don't move them. But if you want the flexibility of multiple programs for several different batches of paper, for example, or maybe a flesh tone program and one for middle gray besides) the approach is different. With an analyzer that only has one memory, you must write down the reference settings for each program before entering another one, so you'll be able to return to any program in the future. These settings are generally indicated on numerical scales associated with the channel knobs, but in some digital analyzers the reference setting may be called up on the display. More complex analyzers provide for additional memories, each with four channels, which allow you to store multiple programs without writing them down. Generally, these are in the form of accessory modules which are separate from the analyzer; they're plugged in for programming or use. But a few of the analyzers in our survey (such as the Lektra 7610 and the Omega SCA-400) have several extra four-channel memories built right in. Extra memories or modules add to the cost, of course; but they're worth every penny if you use your analyzer often enough to need them. One other point: many of the analyzers in our survey have an "electronic f/stop" knob. Normally in color printing, one of the three filter colors (usually cyan) is unused. When you analyze an image, you start by nulling, or zeroing, this "unused" color channel on the analyzer. This can be done by stopping down the enlarging lens, but an electronic f/stop allows you to do the same thing electronically. It alters the values of all three color channels equally and simultaneously, thus preserving the color program relationships while allowing precise, easy initial nulling. Up until now, we've talked only about the eye and memory functions. But there's one other key element to a color analyzer: the readout. Modern analyzers have either an illuminated meter with a moveable indicator needle, or a digital light-emitting diode (LED) display. Most have variable brightness, so they can be dimmed to prevent fogging the paper. With either type, you must null the readout on each color channel to program or analyze color images. Frankly, there's not a heck of a lot of practical difference between the two types; it really comes down to personal preference, though we wouldn't recommend choosing an analyzer solely on the basis of the readout type. Certainly digital displays look more space-age, but they also tend to flicker from number to number in a disconcerting fashion. (If you get them to read within one or two units of zero, you're OK). Meters, on the other hand, must be read with your eye dead center to the meter face, or you'll have a "parallax error" (this is caused by the fact that there is a finite distance between the needle itself and the scale you're reading). The display or meter will also show exposure information when the neutral channel is engaged. Most units these days will read out exposure times directly, but a few require you to null the exposure channel with the lens aperture and use a constant exposure time. Handy associated exposure channel features include adjustable sensitivity (so you can match the analyzer's range to enlarger brightness, say if you're making wallet-size prints or huge murals), optical density scales (so you can use the analyzer as an on-easel densi-tometer) and black-and-white contrast scales (so you can use the analyzer to determine paper grade or variable-contrast filter choice). By the way, the neutral channel can be very handy for exposure determination in black-and-white printing, too. One extremely useful exposure-channel technique is the probing of highlights, midtones, and shadows to predict dodging and burning requirements. To do this, though, you normally need to reset the neutral channel for each reading, or else devote an entire additional memory to a program that really differs only in density. We're glad to see that Lektra has introduced a unit, the 7610, with an extra exposure channel memory. What about those pitfalls we mentioned earlier? The most common error in color analysis is probing an area that's different from the program area. For example, if the analyzer is programmed to a normal flesh tone, you probably won't get an accurate color filtration readout if you probe a well-tanned face. Rule #1, then: the analyzed area must match the programmed reference area. Another concern is the difference between spot and integrated (or "averaging") readings. Generally, spot readings are more reliable. Integrated analysis usually involves "scrambling" the image by placing a frosted translucent material under the lens, then probing the resulting pool of image light that falls on the easel. Rodenstock's "at-the-lens" analyzer is another integrated approach. While the averaging technique is simple to apply and often recommended to beginners, it is also prone to a problem known as "subject failure." If you've programmed the analyzer for a street scene, for example, the excess green of a forest scene will drive the analyzer crazy and lead to erroneous filtration readouts. Even more than with spot readings, then, it's essential to program the integrated analyzer to a typical image, representative of those you plan to analyze. One other point: color analyzers will work with either color negatives or positive transparencies. But it's color neg printing that benefits most from color analysis. You can assess a color slide directly with your eye, but nobody can look at a color neg and tell its exact filtration requirements. 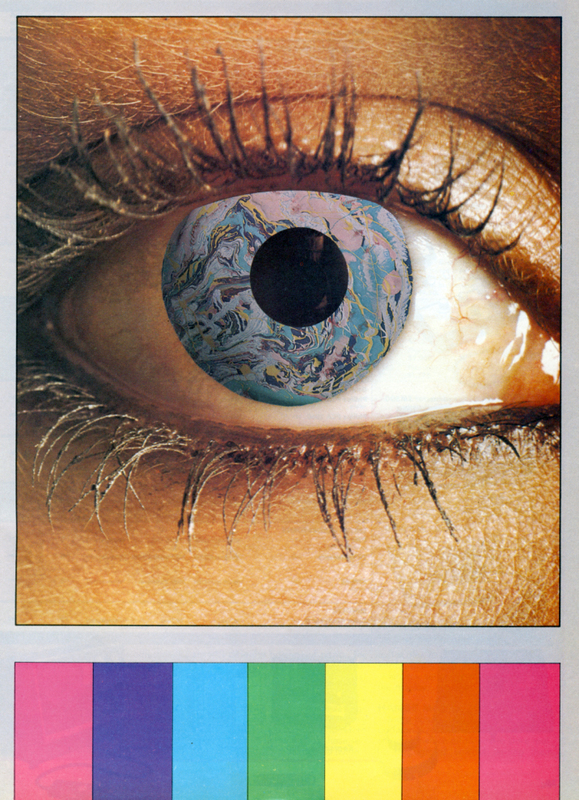 Of course, the assessment you can give a slide with your eye is limited, and in many cases an analyzer is of great help in slide printing—for example when you want to match color filtration in a series of prints of a specific subject. And the analyzer's neutral channel is always very handy for determining exposure times in transparency printing. A color analyzer is an important fixture in the well-equipped color darkroom. Oddly enough, the degree of use may depend upon the skill level of the technician. Most out-and-out beginners are better off without the added complications that an analyzer adds to the learning process. But once the color printer has a good grip on exposure, color balance, and consistent processing techniques, the analyzer begins to be a very useful addition to the whole system. At this medium level, it's not unusual to consult the analyzer for every print. However, the advanced worker, with several years of experience, may find that more and more prints are coming out fine without even turning the analyzer on. This is especially true in personal darkrooms, where standardization of film type and image size, along with smaller paper batch turnover, reduces the number of variables. But even standardized workers are glad to have an analyzer handy, beside the enlarger, for those frequent situations that defy the human eye.